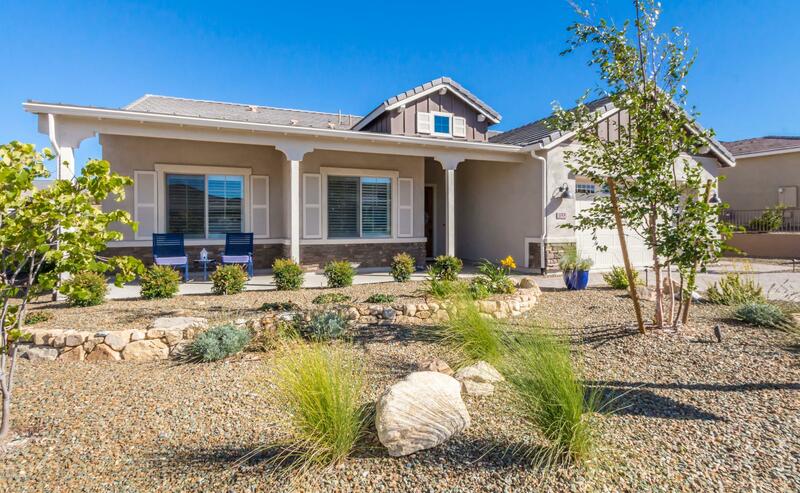 This ''less than a year old home'' Dorn Sonoma model is a show stopper. Beautiful/professionally landscaped front and back yards with magnificent views.Kitchen is fully upgraded with white cabinets/chefs kitchen/gas cook top and wall oven. Dining area has a 2 ft extension. Master Bedroom has a lovely appointedbay window to extend the master by 2 feet. Master bath has a full size walk in shower/double sinks/white cabinetry and nice walk in closet. Great room area isadorned with a corner stack stone fireplace. 2nd bedroom is a guest suite with it's own bathroom. Home is complete with a den/office. Home truly shows like amodel home and is TURNKEY READY. Home still has a builders warranty.